-Dan LaPasha, Ph.D., Learning Technologies, Inc.
Camp Royall is a 133-acre facility owned and operated by the Autism Society of North Carolina. 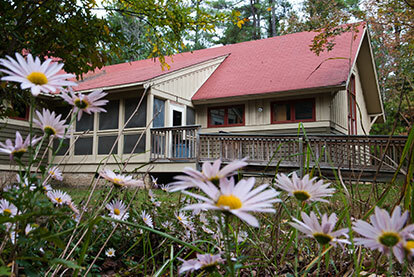 Centrally located, just south of Chapel Hill, the facilities at Camp Royall are available for groups to rent for retreats, meetings, parties, athletic events, and other gatherings. Due to the scope of our Summer Camp program, the facilities are not available from mid-May to mid-August. 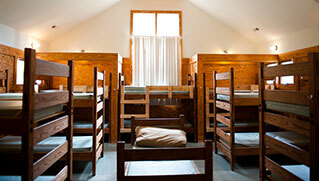 Camp Royall offers three cabins, a large dining hall, and a gymnasium for rent. 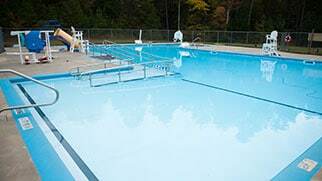 All buildings have central air conditioning and heating, and are fully wheelchair-accessible. Each cabin offers private, semi-private, and shared sleeping rooms, and can accommodate up to 29 people. All cabins have two bathrooms and a laundry room. The Dining Hall seats nearly 100 people and can accommodate different seating arrangements. Camp Royall is not able to provide meal service, but the commercial grade kitchen is available to use. A list of local caterers and restaurants is also available. 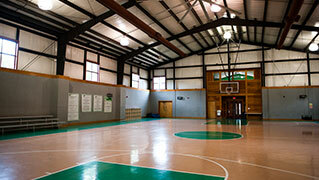 The Gymnasium contains a regulation-size basketball court with bleachers.